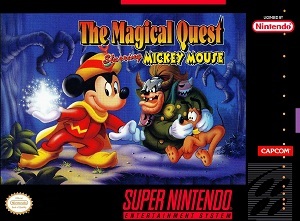 Another great disney game of the 16 bit era, Magical Quest Starring Mickey Mouse is an action-adventure platformer developed by capcom. 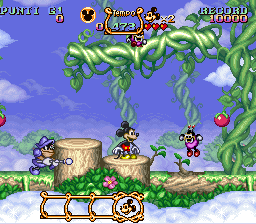 It was well praised for its gameplay, where you control mickey and can choose between four different costumes with different powers such as the magician that shoots magic at its enemies, or the firefighter that can put out fire or push blocks with water. Now you can add videos, screenshots, or other images (cover scans, disc scans, etc.) 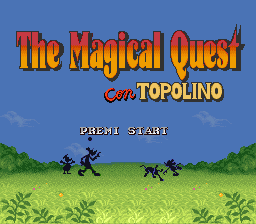 for Magical Quest Starring Mickey Mouse, The (Italy) to Emuparadise. Do it now! If you haven't noticed yet, we have a retro game of the day feature (top-right of the screen) wherein we feature a new retro title every single day! Now, you can vote for your favorite games and allow them to have their moment of glory. Click on the button below to nominate Magical Quest Starring Mickey Mouse, The (Italy) for Retro Game of the Day.